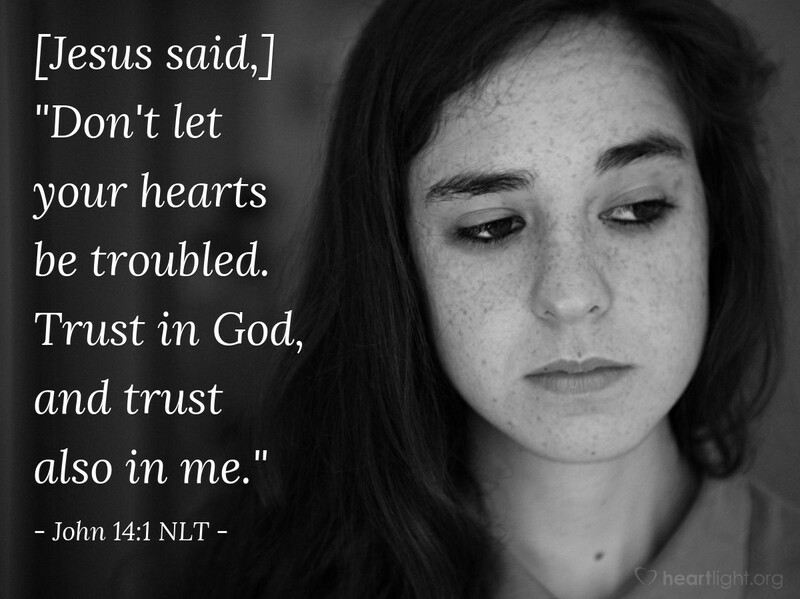 [Jesus said,] "Don't let your hearts be troubled. Trust in God, and trust also in me." All their lives, Jesus' disciples were taught to trust God. Their childhoods had been filled with great stories of faithfulness. Jesus' words (which follow in John 14) will stretch their understanding past the breaking point. He will equate himself with God. They will struggle to understand. Much of what happens will remain an impenetrable mystery to them until Jesus' resurrection and the coming of his Spirit. For them, and for us, these words take on great meaning: "Trust in God, and trust also in me." His point? It's like he's saying, "Trust me! I'm God up close for you!" Jesus is the great reminder of God's concern and understanding of our dilemmas. He is God up close. Righteous and holy God, my Abba Father, I praise you for your love and grace. Thank you for entering our world and drawing close to us in Jesus. Thank you for giving us Jesus so we can know your love and compassion more clearly. I put my trust in him as I pray in his mighty name. Amen.